VF-Engineering designed this kit from the ground up using the “bullet proof” Vortech Engineering V3 supercharger unit. The key to the design of this supercharger kit is the simplicity in which it can be bolted-on. 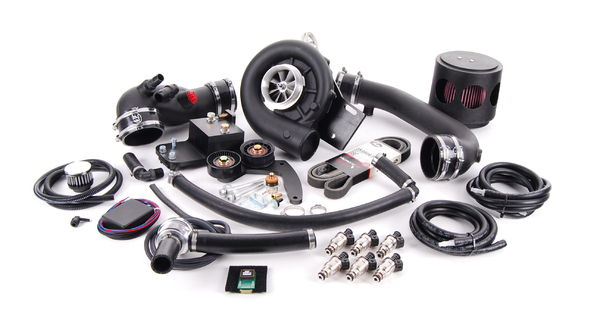 The kit is supplied with every part needed to get your car up and running supercharged on the same day. Power from the silky smooth VR6 engine is increased from 170hp to 250hp and torque from 170 ftlbs to 230 ftlbs with stage 1. Stage 2 increases power to 280 hp and 250 ftlbs of torque. The VF-Engineering approach to kit design and experience has created a bolt on kit with incredible smoothness and driveability. The Mass Air Flow sensor has been relocated and a boost overrun valve (pressure relief system) in incorporated with a “tuned” intake for optimal part throttle and off-throttle deceleration. OBD1 and OBD2 have both been fully homologated with this kit which idles and accelerates as a VR6 should – smoothly and relentlessly. The kit was set up in 2 stages to give you an increasing amount of horsepower and torque. Stage 1 has been discontinued in favor of the demand for a Stage 2 only. Stage 2 includes replacement, direct drop-in Bosch high capacity injectors. The boost is set at 8psi giving a reliable and punchy performance. This product is not compliant with the California Air Resource Board and not for use on public roads in California. This applies to any aftermarket product that does not display a CARB EO#. Power ratings are subject to conditions and dynomometer model used.